There are some adventures that can only happen outside of the classroom. 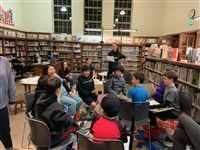 LWHS students joined the West Portal Public Library Bookclub for Boys to lead a trivia game based on the book of the month and showed kids how to process 50million years old fossils! 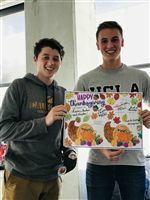 A group of about 30 students hosted another Maker Playground at West Portal Elementary this past Saturday, Feb. 9, featuring a core group of Calculus PPP students who have been planning this event since October. Over 200 West Portal students attended with their families and friends to participate in LWHS-student led educational activities about the solar system, recycling, earth sciences and much more! LWHS' new C.H.E.F. (Charitable, Healthy, and Exceptional Food) works to provide healthy and nourishing food to those in need. They do this by inciting the passion that many Lick-Wilmerding Students have to cook and channeling it towards feeding those who are don’t have access to a kitchen or a regular food supply. This year, the CHEF Club has partnered with Downtown Streets Team to provide food for their volunteers and staff. As a private school with a public purpose, service and community engagement are at the core of an LWHS education. The Public Purpose Program is a way for students to truly live LWHS’ mission and meaningfully engage with local, national, and global communities. The four year program, outlined below, guides students in several ways, from recognizing how to apply their education and unique talents, to ultimately affecting positive change and social justice. In their first year at LWHS, freshmen participate in a yearlong workshop series that explores privilege, the roots of inequality, volunteerism, and community. This curriculum culminates in a day of service during the spring semester where the entire freshman class begins to enact the mindsets and attitudes cultivated over the year. Sophomores spend the year completing 40 hours of service. With the support of the Public Purpose Program, students can partner with local organizations, participate in Center for Civic Engagement sponsored projects, or find their own opportunities. At the end of the year, sophomores take part in an LWHS Volunteer Exhibition, in which they present information on their service and highlight local organizations with whom they have partnered. Freshmen attend this exhibition and begin to think about how they can complete the service requirement during their sophomore year. Juniors complete their Public Purpose Program requirement by enrolling in an academic class with a service learning component, designing a relevant independent study, or working as an intern with a local nonprofit organization. Seniors may choose to deepen the inquiry they began during their junior year by interning with the same organization or pursuing similar service-based academics. Alternatively, they may decide to design an independent study based on a different theme, take a course with an alternative focus, or apply for a new internship. Aim High is an award-winning summer program for middle school youth combines rigorous academics with a fun and highly supportive learning environment. It has been supporting students and families for 25 years. Read more about the history of Aim High and their connection to LWHS. BATTI is a two-year elementary school combined masters and credential program under the sponsorship of University of the Pacific, Stockton. Our students work as paid, full time assistant teachers in one of 25 independent schools in the Bay Area while taking credential classes two evenings a week. Close supervision from thoughtful, experienced mentors and supervisors creates an atmosphere of reflection, collegiality, and support. Established in December 2010, the Ocean Avenue Community Benefit District is one of the newest CBDs in San Francisco. The district boundaries include properties that front Ocean Avenue from Manor Drive on the west running along Ocean Avenue to Interstate 280. There are 148 properties within the district including commercial, retail, educational, non-profit and residential uses. Managed by a nonprofit organization called Ocean Avenue Association, this district will focus on cleaning and maintenance, safety, marketing, and streetscape improvements for 15 years. Youth Art Exchange provides free after school and summer programming in visual and performing arts to public high school students in San Francisco. They also offer a number of paid internships and other youth leadership opportunities. Students come to Youth Art Exchange for a chance to experiment in the arts and a place to be themselves; they find artistic training, new mediums for self-expression and a diverse and supportive community. The office of Youth Art Exchange is located at LWHS and offers classes Monday–Thursday from 3:30–6:30pm. If you are a nonprofit wanting to reserve space at LWHS—Thank you for your interest in hosting an event, meeting, or conference on the LWHS campus. Due to the volume of requests we receive, we are not able to accommodate every request. Please review the information below and then contact Director of Student Inclusion, Leadership and Civic Engagement Christine Godinez or your faculty/staff sponsor with any questions and your actual request. Please note we don’t process requests between April 15–August 15. The LWHS Facilities Manager makes the final decision on reserving space at LWHS. We only host events for nonprofit educational organizations or Ingleside-based community organizations. We require a minimum advance notice of 15 working days. We do not provide technical support or Internet access to organizations who use our space. A damage deposit may also be included in the assessed fee as determined on a case-by-case basis. Note: Proof of liability coverage is required. If an organization is unable to provide proof of liability coverage, an indemnification agreement may be used as a substitute. Dedicated to exposing LWHS students to leadership opportunities. Access a variety of resources to help you explore meaningful connections to people and organizations. LWHS and ViviendasLeón partner to create a program in international travel and service learning in León, Nicaragua. LWHS and Drew School document and reflect on a service learning trip in West Africa. What does it mean to give responsibly?